I went to a couple of Targets today to see if I could snag the Hoth BPs and the Geonosis sets. No luck for me. OOOOH! I WANT COMMANDER GREE, LUKE SKYWALKER, AND HAN SOLO UBER BAD!!! I can see how this wave will appeal to carded collectors, or collectors who are new to the line. But I think this wave is a real dud - one of the most boring waves I have ever seen in my 13 years of collecting. Not too happy about Barriss' robe being soft goods, but otherwise it is a very strong wave. Thanks, Hasbro!!! I do not remember seeing Barriss' in the films, I am slightly confused.. am I missing something.. I feel as if I am..
Barriss can be seen at the beginning of AOTC, when Yoda and Mace Windu are conferring with Palpatine in the latter's office. And she can also be seen igniting her lightsaber in the arena near the end of the film. 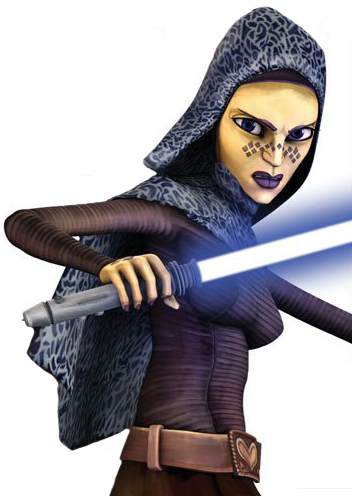 I do remember her appearance in the TV series ofcourse, just not the movies.. but now that I have been gave it a second look she is definitely in the film as directed Fisto, thanks for pointing that out to me..
Be aware that this new set is not coming with Red Leader and his astromech droid. On a side note: there are some collectors on Rebelscum who are stating that they are going to consider Fi-Ek Sirch to be the movie version of Master Di. Thus, he would be Di-Fi-Ek Sirch. I like that idea a lot! Kinda like applying the name Bolla Ropal to the Rodian Jedi included in the Geonosis 2-packs.